Disclaimer- This is a recap of my race experience. I don’t recommend/encourage running a race while sick. Wow. That’s really all I can say. Just kidding, I have a lot to say actually. 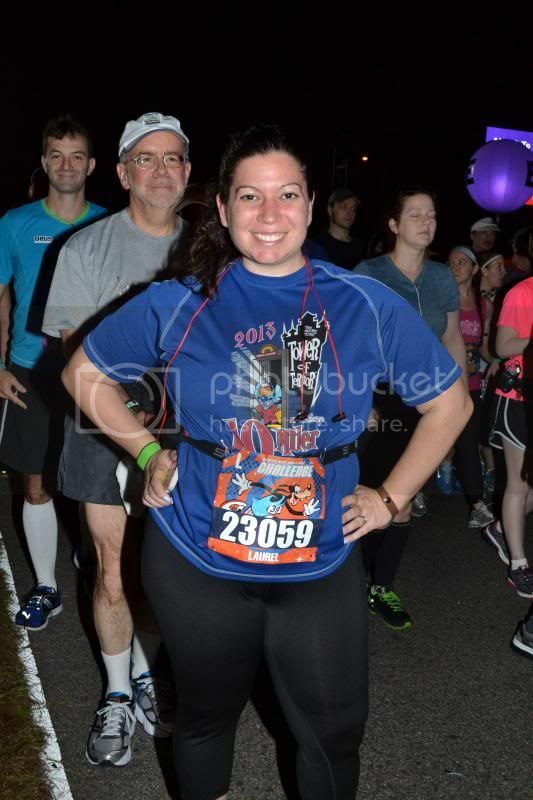 But my experience at Walt Disney World Marathon Weekend really blew me away. Unforgettable. 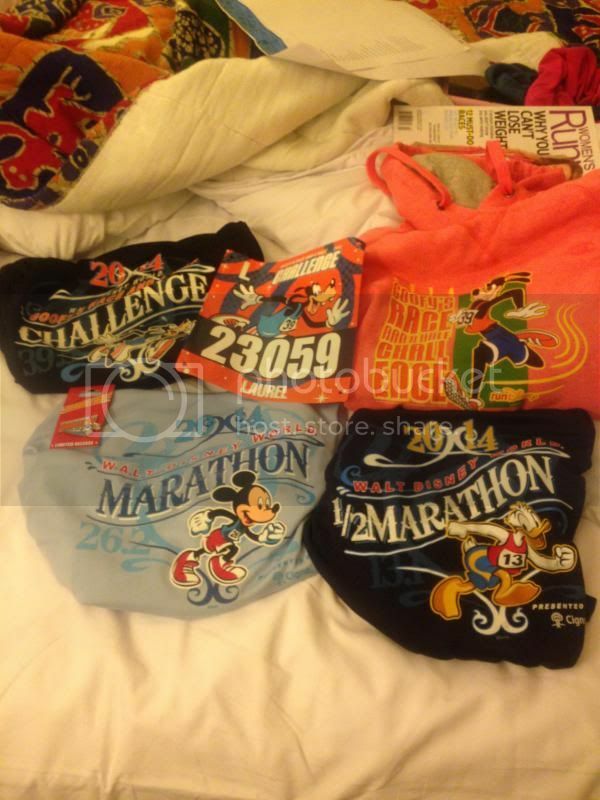 But first, if you’re not familiar with my back story (and obsession with this race), you might appreciate reading my experience from last year’s Goofy Challenge. Dan and I flew to Orlando from Japan with a brief layover in Denver. After 14.5 hours of flying, luggage wrangling (oh there was luggage. Don’t forget, this was my official move the the States! ), and procuring a rental car, we arrived at our hotel for the next week! My throat was scratchy on the flight and I began coughing, but I chalked it up to the recirculated air. A good night’s sleep was all I needed, I’m sure. Wrong. I woke up the next day feeling like I had a golf ball stuck in my throat, with a plugged up nose that wouldn’t decongest. This wasn’t happening. This WASN’T happening. It was Friday, the day before Goofy Challenge began. And it all felt so unfair! I was here and I did the work! I trained! Nothing was supposed to stand in my way of that Goofy medal I dreamed about all year!! I decided not to get ahead of myself. I got up and got ready. Off to the expo at ESPN Wide World of Sports. Got our bibs and race shirts. Perused the booths but it was so crowded that we didn’t stay long. After the expo, we went to T Mobile so I could upgrade my MyTouch 4G to an iPhone 5. There was a hiccup at the first place we went to, so we found another store and were in business. Once that was done, we wanted to do something fun but stay off our feet. We went to Downtown Disney and saw Frozen at one of AMC’s neat dine-in theaters. I LOVED the movie! Seriously, if you haven’t seen it, go see it! 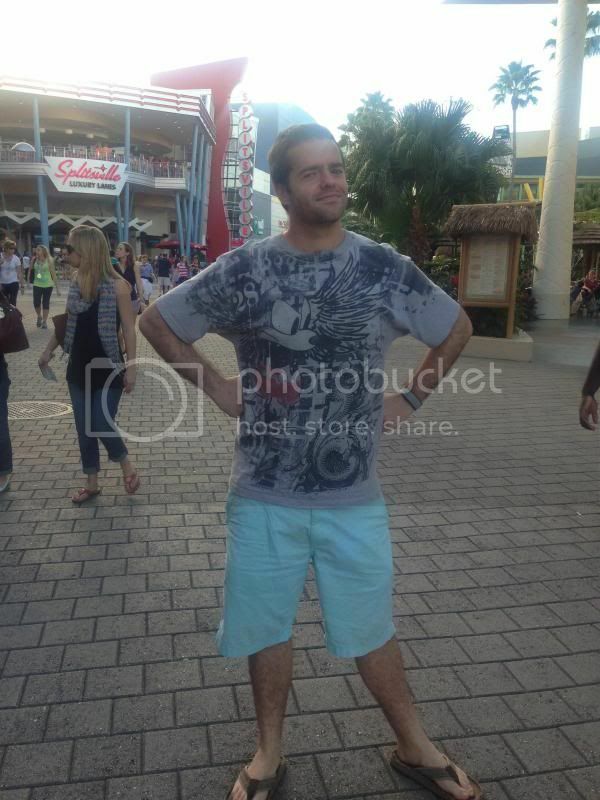 Dan at Downtown Disney. We also picked up some extra Gu packets at the new running store and I drooled over the confections at Candy Cauldron. I was starting to feel worse and worse. I had a wet, unproductive cough. We left Downtown Disney and stopped by a Hess (minimart) to get some cold meds for me, and Dan wanted some iced coffees for the room. Then it was back to the hotel to rest! We had dinner at Mara, a quick service restaurant at the hotel. I had the chicken pita and it was good. Well, probably. I couldn’t taste much at this point. Got dressed and onto our bus. 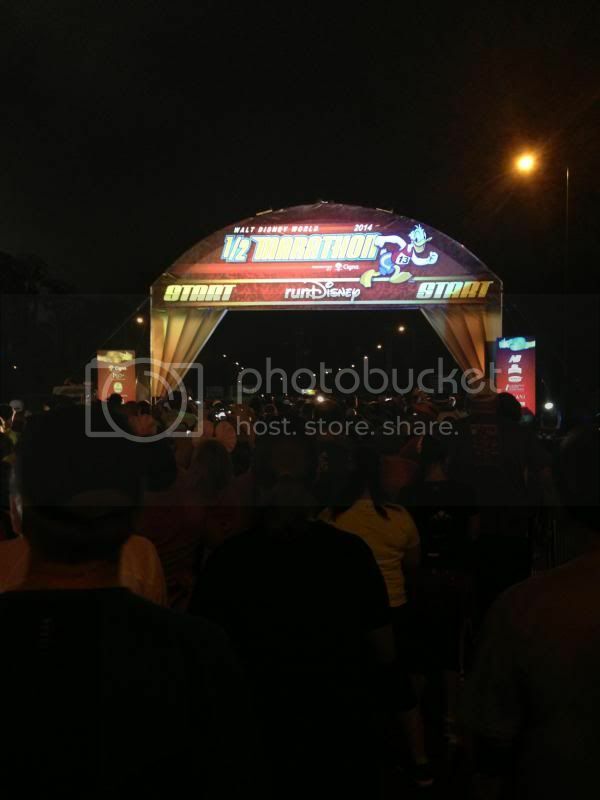 We were bussed to runner’s village, aka the finish line area. We quickly found our group of friends from an online running club and took a photo. Sorry it’s blurry! 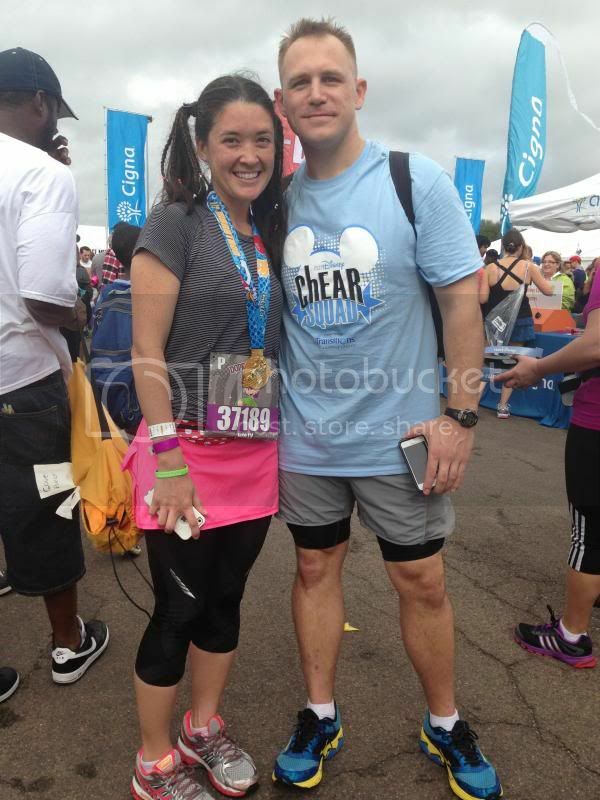 We chatted with people for a bit then made our way to the starting corrals, which is nearly a mile walk. I wasn’t so much as nervous, as anxious to get it over with so I could go back to bed and rest. Dan and I parted ways as he was 4 corrals up from me. I found my friend Staci and we sat and stretched and chatted for a bit. It was nice having someone to talk to since we had to be in our corrals 45 minutes before we even started (and my corral started 40 minutes AFTER that!). Eventually she had to get to her respective corral and I headed to mine. I was hoping to see my friend Holly too but I was herded into my corral and missed her. In my corral and ready to go! Corral A was off. B. C. D. On and on it went. We slowly shuffled up to the start line. I just wasn’t in a great mood. It was muggy out. I knew it wasn’t going to be drop-dead hot like it was last year, but it was still warm and humid. Soon enough it was time for corral L to hit the course, and with a 3 second countdown and launching of fireworks, we were off! I started off with a steady pace. I felt like I wasn’t going terribly fast, but I was dodging a lot of walkers. I hit mile one faster that I thought, but when my GPS tracker read my pace I was really disappointed. I was nearly 2 minutes off pace! The only good thing was at least I wasn’t coughing much. When I did cough though, I couldn’t stop! Bleh. Miles 1-4 took us down World Drive. We passed under the big Magic Kingdom sign and through the toll plaza. 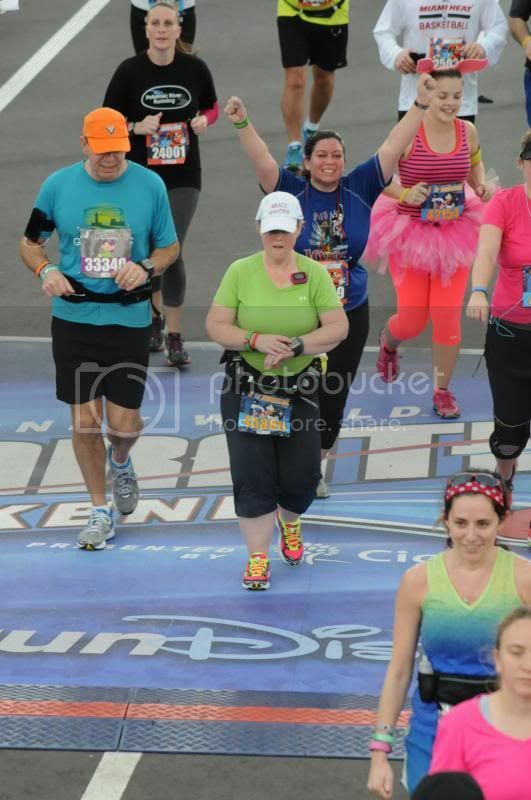 We ran around half of the outside of the Disney Speedway (race car track). I felt a pang of nervousness then. 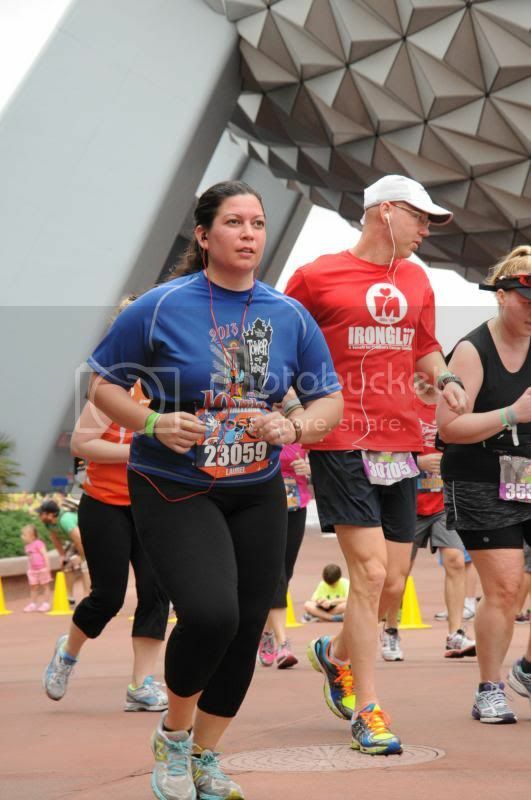 When I ran the marathon last year, the race track was where I completely lost steam. My power walk turned into a regular walk. I tried not to think about it though. This year had nothing to do with last year. So on I went! I was approaching the Transit and Ticketing Center when I started to see more spectators. I then realized our friend Matt might be out here somewhere. I tried searching for him but there were so many people. And then there he was! I got so excited I yelled his name and started jumping up and down. I ran over and high fived him and kept running. It seriously gave me such a pick me up. I need to get more people to spectate my races!! Matt being awesome. He even made a sign for us!! After seeing Matt I ran past the Contemporary Resort. We then accessed a private road for cast members and crossed into the back stage area of Magic Kingdom. At this point I saw a runner friend I’d never met in person but was well acquainted with via Facebook and Twitter. I took a shot and yelled his name, Mel, ready to introduce myself. Surprisingly, he recognized me right away and gave me a hug! He was so happy and friendly, it was awesome and I’m glad I stopped to say hi. He welcomed me back to the States too! Eventually we ran onto Main Street inside Magic Kingdom. And even though I was miserably sick, and hot and sweaty, I couldn’t help but smile. I was running towards the castle! Down Main Street and through Tomorrowland and Fantasyland I went. And then right through the castle! Once past the castle it was a quick stint through Frontierland and out of the park via a gate just past Splash Mountain. 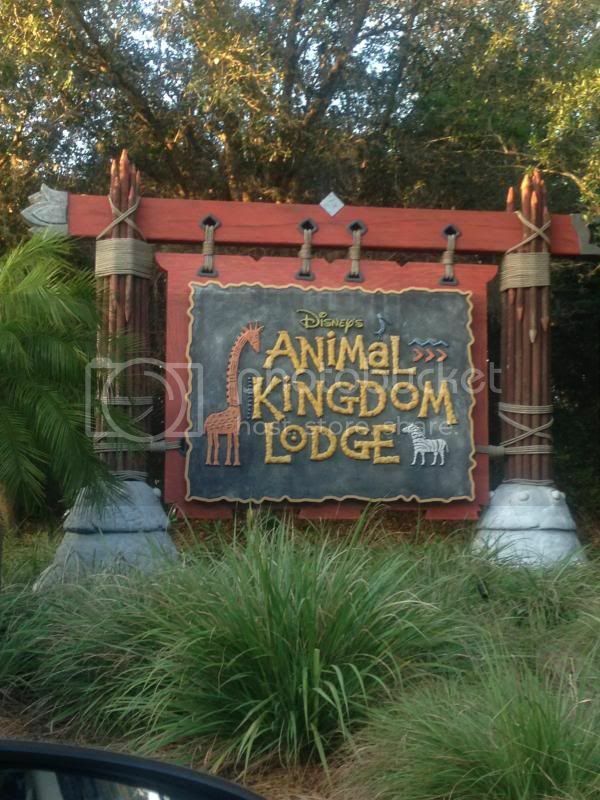 Continued on through another behind the scenes area and out onto Floridian Way. I was really feeling bad at this point. More worrisome thoughts on last year’s experience and getting swept. I knew I was fine for the half, but the full was creeping into my mind more and more. I decided to have some fuel. I’m a huge fan of Ostrim, which is a high protein jerky. I had 3 or 4 little pieces and kept running. Not long after, I started having awful stomach pains. I suppose the meat product was just too heavy in my stomach. In the past I had it as pre-race fuel, giving it time to digest. So, as if I didn’t feel bad enough already, I just wanted to curl up in a ball clutching my stomach. It served as a crucial reminder- nothing new on race day!! We kept running down Floridian, aka the longest road ever. I was keeping an eye out for my friend Holly, but at some point she passed me and I didn’t see her. There was some on course entertainment- spectators, characters you can take pictures with, music. I just stared at my feet and ran. Well, jogged. Shuffled on, really. We eventually ended up back on World Drive, heading to EPCOT. The sun is out in full force. Dan and Holly have both finished. I just want to sit down. My feet actually felt fine, but everything else hurt, or was stuffy, or sore. Up the onramp I went, moving at a snail’s pace. 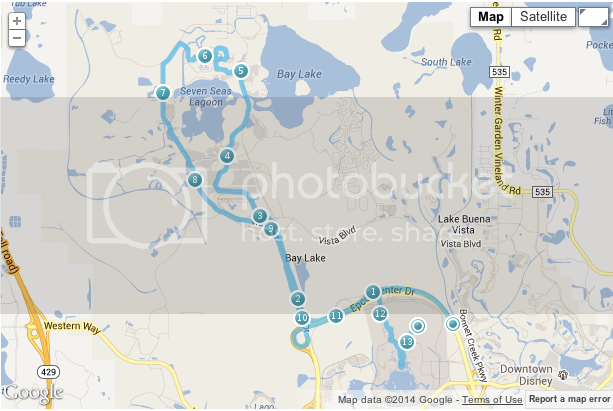 I was then on EPCOT Center Drive for a little over a mile. My stomach was still angry about the jerky thing. I was hitting every water stop. Finally we went up an overpass and down, and were in the EPCOT parking lot. I saw Lou Mongello, host of the Mickey Miles Podcast, which I’m a fan of. 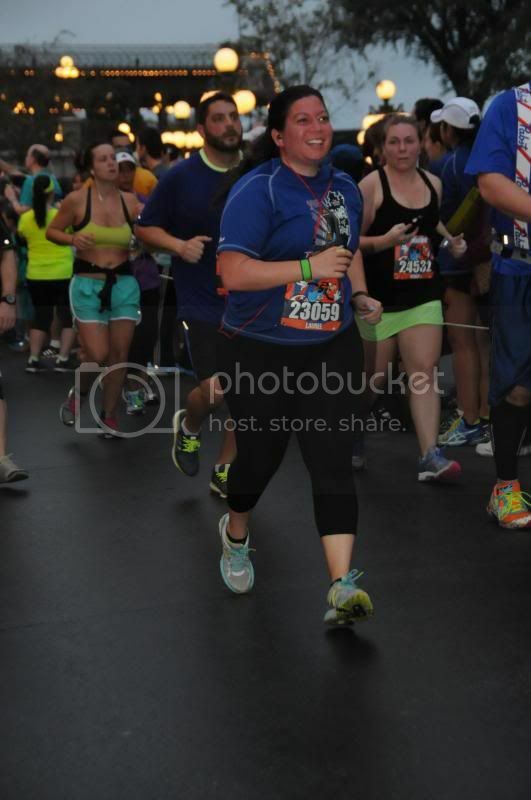 I was so close yet so far… I had just passed Mile 12. Into EPCOT I went, where we run to the International Gateway and U-turn back to the front of the park. This is the face of determination. Or misery. 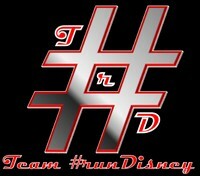 Now at a Run Disney race, you can’t just cross the finish and be done with it and go see your family. You have to walk through the runner’s chute. First you get your medal. Then there are long tables of water and Gatorade. Then the snack box table. Then the photo panel, where you can have your photo taken. And new this year, you get a wristband saying you completed the race, which you needed to get your Goofy medal the next day. More walking til finally you are dumped by bag check. Dan, Matt and Holly were all waiting for me. I felt downright awful. My head was in a fog and I needed to sit down. I felt like a terrible friend to Matt and Holly, whom I’d been looking forward to seeing all morning. Matt and Holly. Holly was doing Dopey Challenge- 5k, 10k, half and full! I just knew I needed to get out of there. I was really sad, because originally Dan and I had planned on going out to a fun breakfast and inviting Matt and Holly along. But as I’m always learning in life, things don’t go as planned. Back on to the hotel bus we went. 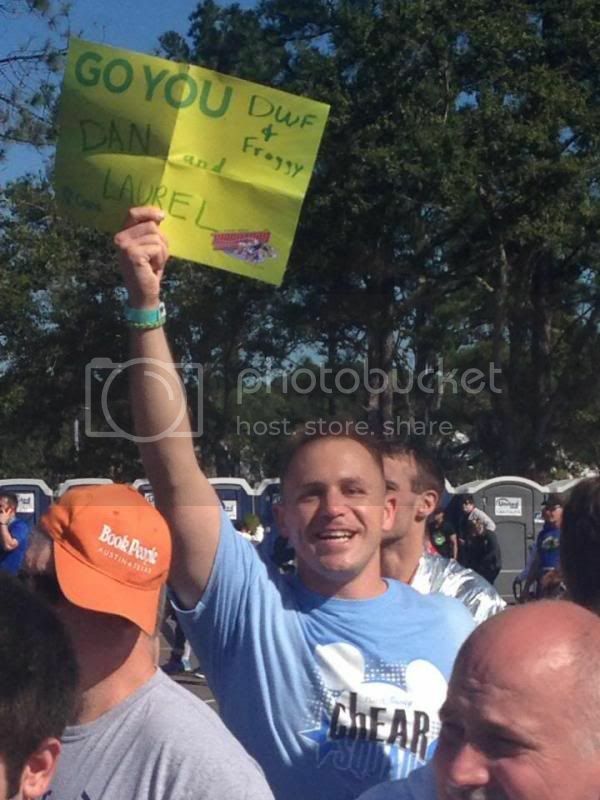 But first, Matt was nice enough to take a pic of Dan and I! Once back at the hotel, I started addressing my needs. Food. Water, water, water. Elevated my feet. Took a mini nap. Besides being sick, my body felt fine. My feet weren’t sore and no sore muscles. Thank goodness for training! Wow! Way to go with the half! 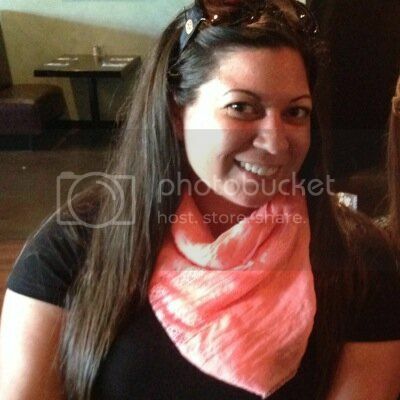 I am on a weight loss journey and have recently signed up for my first half. I am beyond nervous, but also very excited. 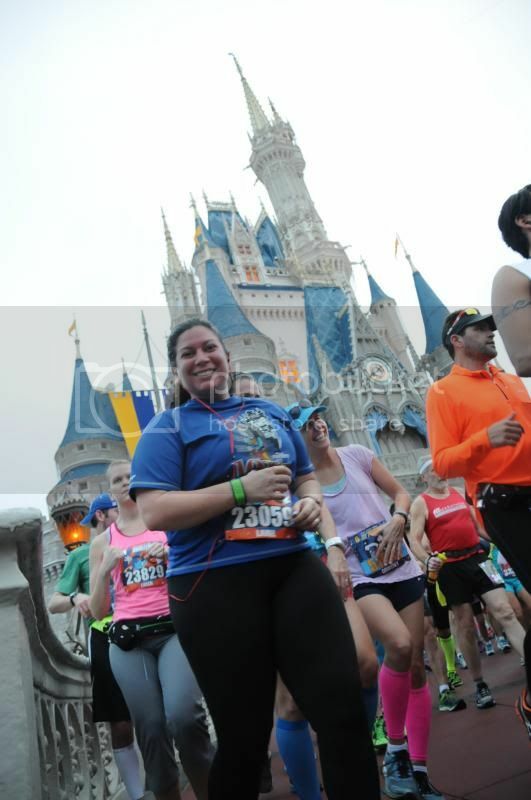 I also have my sights set on the Disney half when I reach my goal weight. 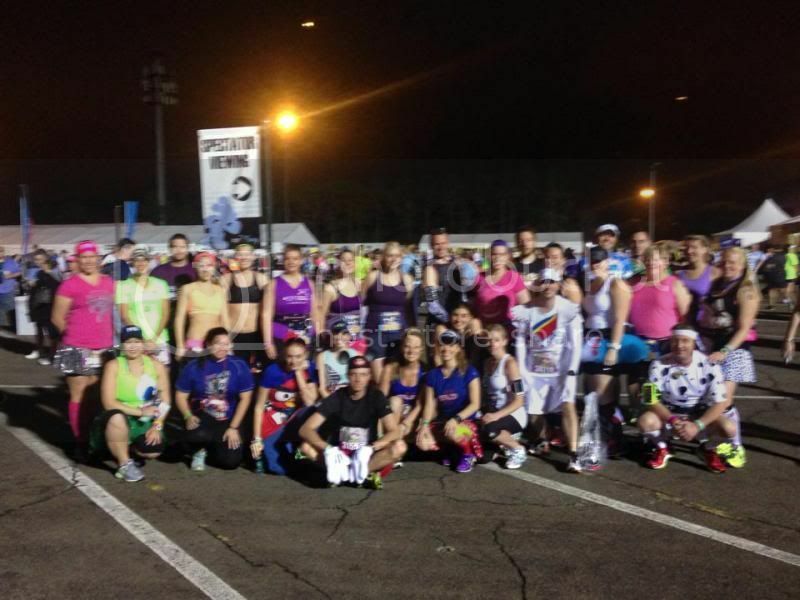 I am excited to read your marathon recap! That is awesome! 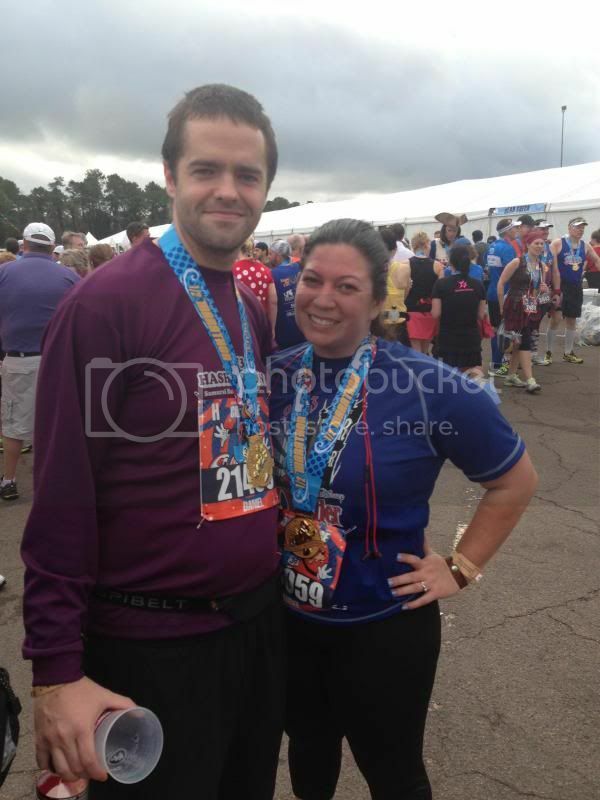 I only started running/ losing weight so I could run the Disneyland half (http://penniestoyennies.com/?p=164). It wasn’t easy, but the race was so magical, I could have asked for a better first experience! I’ve run near 20 races now and I STILL get nervous, even for 5ks! Keep in touch, I’d love to know how it goes! Alright! One down, one to go! Can’t wait to read the rest. Don’t know if you remember but we “met” on Facebook during a discussion about (what else?) being swept. I was wondering how you did during marathon weekend. Hope all is well. Yay Laurel! Can’t wait to hear your report about the full. Love how you just put your head down and ground it out!